Is it safe for your dog to eat Bluberries? Read more to find out. Blueberries provide numerous health benefits for humans, but pet owners often wonder whether or not these types of berries are safe to add to a dog’s diet. There are some important facts that pet owners should be aware of if they are thinking about letting their dogs eat blueberries. As many people already know, certain foods that are staples in the human diet can be harmful to a dog’s sensitive digestive system. According to Vetinfo.com, dogs process food much faster than humans, and certain types of food can have quicker and much more harmful effects. Foods such as guacamole, chocolate and grapes contain agents that are generally safe for humans but can cause fatal harm to dogs. The health precautions associated with certain foods have convinced many pet owners to only give their dogs standard pet food. There are many foods that are generally safe to give to dogs in limited quantities. Watermelon, oranges and other types of fruit can provide an occasional treat if all seeds, stems and peels are removed. It should be noted, however, that some of these foods can cause upset stomachs and diarrhea if given to dogs in large quantities. Blueberries are among the food options that are generally safe for dogs as long as they are given in small amounts. A few blueberries can be mixed into a dog’s regular pet food or can be given individually as bite-sized treats. Too many blueberries given to a dog can result in gas, cramping and other digestive discomforts. The same goes for strawberries, raspberries, blackberries and cranberries. However, it is always wise to take a dog in for a vet examination before introducing any new foods to its diet. 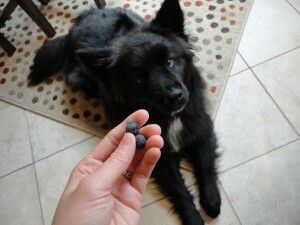 What do other dog owners have to say about whether their dogs can eat Bluberries or not? See comments below. Know if dogs can or can't eat Bluberries? Help other dog owners by leaving a comment.